Special Educational Needs and Disability (SEND) is a topic with a vast amount of information, legislation and related services. This page aims to give an overview of Special Educational Needs and disability, provide guidance and explanations of key policies and strategies related to SEND, and point to useful organisations and websites. A useful source of a range of information related to Special Educational Needs and/or disability can be found on the Cornwall Council SEN File. 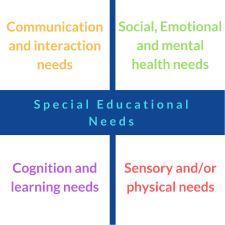 Special educational needs are referred to as SEN. The abbreviation SEND relates to special educational needs and/or disabilities. Guidance, legislation, and regulations sometimes use the abbreviation SEND. Individuals who experience SEN comprise the largest potentially vulnerable group of children and young people in Cornwall, 13.5% of the population. Our identification of SEN is in line with the national profile. Sensory and/or physical needs –sensory impairments or difficulties such as those affecting sight or hearing, or physical difficulties which impact on their learning Individual children or young people may have needs that cut across some or all these areas and their needs may change over time. Sometimes as a parent you may be the first to be aware that your child has special educational needs. If you are concerned about your child’s progress and think that your child may have special educational needs you should first talk to your child’s class teacher, tutor and/or to the Special Educational Needs Coordinator (SENCO). Every school or Early Years setting has a SENCO, who is the person responsible for coordinating help for children with special educational needs. Colleges also have a named person responsible for the coordination of SEN support and provision, similar to the role of a SENCO. Every school also should publish a SEN Information report that explains how their school supports pupils with SEN. If you still have concerns and want to discuss this with an independent body you can contact Cornwall Special Educational Needs Disability Information, Advice and Support Service (SENDiass). The service is confidential, independent, impartial and free. My Child has Special Educational Needs, how will they be supported in educational settings? Most pupils with SEN in Cornish mainstream schools have their needs met at SEN Support. SEN Support is provided through a graduated approach . This is set out in the SEND Code of Practice (p.100) and supported by the Children and Families Act 2014, which both state very clearly that early years settings, schools and colleges have to meet the needs of all children and young people with Special Educational Needs, including those that do not have an Education, Health and Care (EHC) plan. 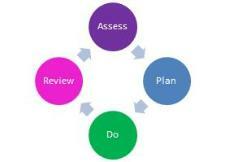 Staff in early years settings, schools and colleges must use the graduated approach four step process: Assess, Plan, Do, Review. Cornwall’s Graduated Response document gives the expected standards and provision for pupils across Cornwall. There is also a Guide for Young People and Families to the Graduated Response to Special Educational Needs. A very small number of children and young people may not make progress despite SEN support. In these cases an Education, Health and Care (EHC) needs assessment may be appropriate. This is a detailed assessment of a child or young person’s special educational needs and the support they may need in order to learn and progress. To find more information about EHC needs assessments and plans visit our information page. Education, Health and Care plans can be referred to as EHCPs or EHC plans. An Education Health and Care plan is for children and young people aged up to 25 years, who are in education or training, who need more support than is available through a school’s own SEN support. An individual’s Education, Health and Care plan identifies their educational, health and social needs and sets out the additional support to meet those needs and where their education or training programme will be delivered. The plan will be reviewed every year or more often if circumstances or needs change.